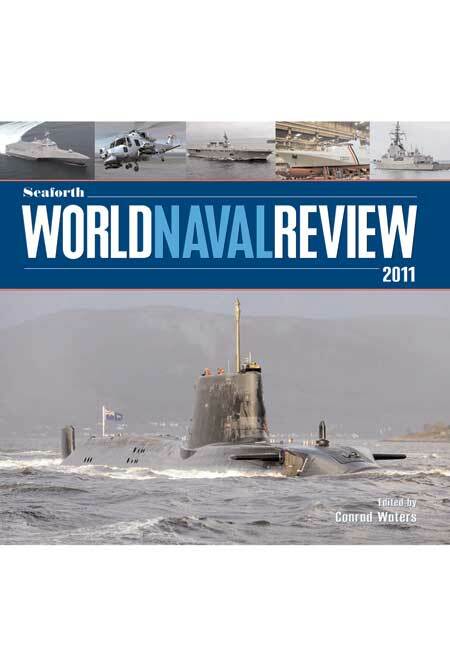 You'll be £25.00 closer to your next £10.00 credit when you purchase Seaforth World Naval Review 2011. What's this? Order within the next 41 minutes to get your order processed the next working day! Launched in 2009, this annual is rapidly establishing a reputation as an authoritative but affordable summary of all that has happened in the naval world in the previous twelve months. It combines the standing features of regional surveys with one-off major articles on noteworthy new ships and other important developments. Besides the latest warship projects, it also looks at wider issues of importance to navies, such as aviation and electronics, and calls on expertise from around the globe to give a balanced picture of what is going on and to interpret its significance. This year special features include in-depth studies of the growing naval power of Turkey and South Korea, plus analyses of four significant new warship classes: the RN's Astute class nuclear attack submarines; India's Project 15 destroyers; the Norwegian Fridtjof Nansen, the smallest warship to carry the Aegis weapon system; and USS Independence, an innovative littoral combat ship designs. Intended to make interesting reading as well as providing authoritative reference, there is a strong visual emphasis, including specially commissioned drawings and the most recently released photographs and artists' impressions. For anyone with an interest in contemporary naval affairs, whether an enthusiast or a defence professional, this annual is set to become required reading. No one who is seriously interested in naval matters for business of pleasure can afford not to own a copy of this book. This is an excellent book which is highly recommended for all those wishing to keep abreast of the world's naval developments. Seaforth World Naval Review 2011 provides compact surveys of the world's navies on a regional basis, and also in-depth consideration of significant modern warships and selected technological reviews (radars, refitting processes, aviation developments). Edited by the redoubtable Conrad Walters 'The World Naval Review' maintains Seaforth's traditional high standards of production. Well laid out and superbly illustrated throughout, with many data tables and clear summary boxes as well as offering its top-level expert analysis, it represents excellent value for money. Overall this superb publication is a must for all those interested in anything naval at home or abroad. The book i well put together, easy to read with brilliant sharp photographs. Overall, it is excellent and recommended. Seaforth's World Naval Review 2011 is the ideal companion piece to the classic Jane's Fighting Ship. This book expresses a vast quality of extremely detailed information. It has a executive style overview and last years addition was was selected as the book of the year by Warships International Fleet Review. This Seaforth review is written by an impressive group of contributors. The book is beautifully laid out to Seaforth's traditionally high standard. It has many data tables and clear summary boxes, and is superbly illustrated throughout. An excellent book which is a must have, highly recommended. Conrad Waters, a barrister by training and a banker by profession, has had a lifelong interest in modern navies about which he has written many articles. He also compiled the annual review of navies for the journal Warship and was the founding editor of Seaforth World Naval Review.